The Warren & the World is Story Warren's weekly newsletter, providing a round-up of our favorite things from around the web as well as a review of what was on our site over the past week. We're glad you're here! There is something about baseball that makes mankind wax eloquent about the rhythms of life and the great big truths played out on dusty, sunny diamonds. Jonathan Parnell's piece at Desiring God blog is no exception. Baseball, unique from other sports, follows this natural calendar — starting in Spring, ending before Winter, only to be resurrected again the next Spring. It has been that way for over a hundred years. This game — this little, creaturely game — is saying more than it knows. The game is almost a scandal. It is almost unbelievable, I explain — incredibly hard, but amazingly gracious. Jesus is the only perfect man to ever live, I tell him, and baseball is a game for dust like us. I'm all caught up in the dreams of September baseball. Maybe you are, too. Read more. I grew up on a steady diet of the Little House on the Prairie book series (well, and TV series, too). My mom read through the books with us multiple times as bedtime reading, and I have vivid memories of cuddling up under Great-Grandma's patchwork quilt and hearing of the days in Indian Territory or the Long Winter. I was delighted to discover, this week, through an excellent article at The Guardian, that an annotated edition of Wilder's autobiography is due out in November. The South Dakota Historical Society Press will release a researched version of the book for the first time this autumn, including more than 100 images, maps, and hundreds of annotations drawn by editor Pamela Smith Hill, author of a biography of Wilder, from additional manuscripts, diaries and letters. "Wilder's fiction, her autobiography, and her real childhood as she lived it are three distinct things, but they are all closely intertwined, and readers will enjoy seeing how they reflect one another. Even more interesting, though, are the places where one story differs from another, and Pioneer Girl: The Annotated Edition explores these differences too," said Nancy Koupal, the publisher's director. The article also links to a site chronicling the Pioneer Girl project. Release date seems to be mid-November, so you've got plenty of time to make sure you get most of the series in as bedtime reading. Read more. Jennie Allen guest posts at A Holy Experience reminding us that the moments in our lives are not small, but rather they hold deep meaning. She tells a story of a friend who was arrested on a misunderstanding and imprisoned for 24 hours before it was sorted out. Because in the twenty-four hours she was in prison, she glimpsed the eyes of women starving for God. Prison starves for God, and God took her pure little light right into the darkness. You may find yourself today in gym shorts and a T-shirt or work clothes and not in an orange jumpsuit, but hear me: you live in a world that is dark and craving light. People’s eyes are starving for God, dying for freedom. She goes on to say, "We are filled with God to pour Him into the darkness. Pour Him into the broken souls who are starving for something." Read more. Chris Yokel writes at The Rabbit Room of our need, our drive to re-enchant ourselves as we live in a world where bad theology threatens to disenchant us. Why is this drive to re-enchant ourselves so tenacious? Or even further, why is it important? The reason is that such fantasies, while not true, do point us to a truth about the world, that the physical is woven inextricably with the spiritual. As Christians we have also been somewhat guilty of disenchanting ourselves with bad theology, particularly in our portrayal of heaven. We have often imagined and spoken of heaven as being a long way off, “up there” somewhere, removed from the fallen world. But the reality is that heaven and earth are not so far apart. "Earth's crammed with heaven/ And every common bush afire with God," Chris quotes Elizabeth Barrett Browning. Read more. 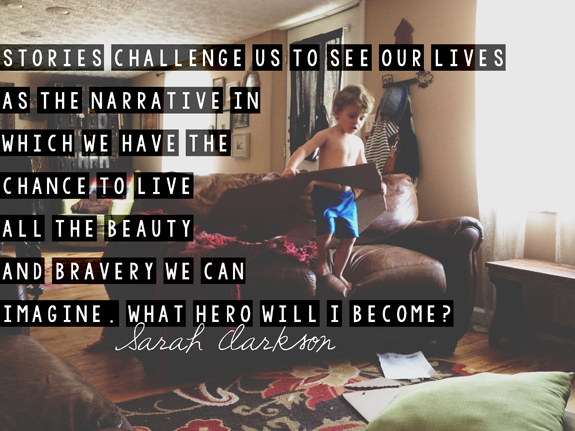 What Hero Are You Going To Be? Nate and I are both adults now, and you might assume that the difficult realities of adulthood—the work and compromise and practicality needed for life in a modern world—might have dulled the edge of our ideals. Successful citizens, productive adults, contributing members to family or society, you might think those reasonable goals would replace our youthful, wild-eyed hunger for heroism. Why? Because we are storyformed souls. It was a storyformed week at Story Warren, and Sarah's piece sets the stage. Read more. "…What hero will I become?" Sarah Clarkson's words. Paul Boekell's word art. Julie Silander writes of the impact Sarah Clarkson has had on her family's life, and shares the joy of seeing Sarah launch her new site, Storyformed.com, and her new book, Caught up in a Story. She took her place behind the podium, glanced down at the sheet of neatly typed notes, then lifted bright eyes to scan a sea of eager faces. Her gracious smile hinted at a tender heart. She began to speak. Although a generation younger than much of the audience, her words were girded with wisdom and confidence. Vibrant vision grown from the rich soil of experience. She spoke of serving others through beauty and truth – of living a winsome life. Her message was seasoned with titles like The Little Princess,Babette’s Feast, and a number of other works that explore and inspire goodness and imagination. That blustery January day, Sarah Clarkson planted seeds of inspiration in the hearts of a multitude of parents. I was fortunate enough to be one of them. Join the Story Warren family in celebrating Sarah and this new chapter of her adventure. Read more. It's Hilaire Belloc. He was friends with Chesterton and he wrote subtitles like that…it's worth your time! Today I sat in the sunshine and felt quite warm, but I know cooler days are coming. I've already seen the beginnings of leaves changing color. There are all sorts of fall leaves crafts you can create with toilet paper rolls. At KidsKubby.com there's a whole slew of them–but I particularly like the wreathes and vines. See what you like! 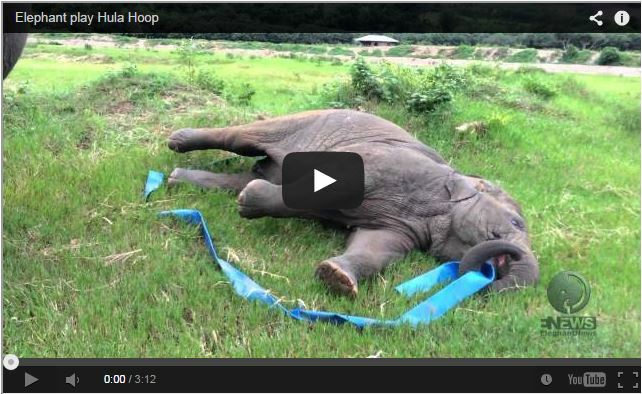 A baby elephant at a preserve in Thailand got a hold of a great big ribbon–and it's delightful. Thank you for reading. We're on your side.